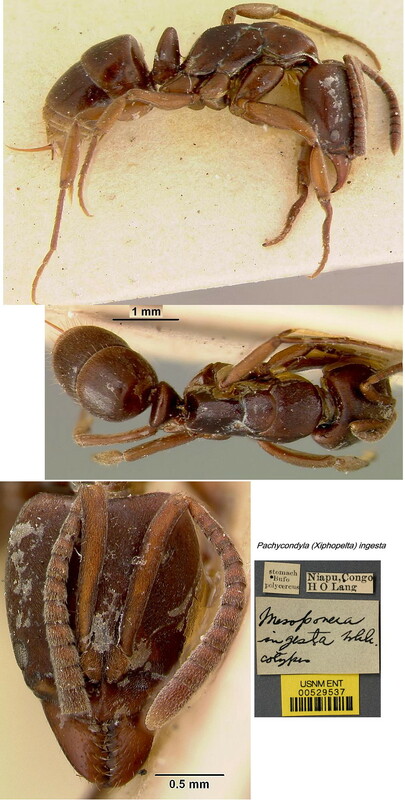 Type location Zaïre (Euponera (Mesoponera) ingesta, Wheeler, 1922: 88, illustrated, worker; in Pachycondyla Bolton, 1995: 306; new placement by Schmidt & Shattuck, 2014: 110); collectors Lang and Chapin), all specimens taken from toad stomachs, at Akenge (type), Niapu, Fardaje and Lubila. Description by Wheeler (1922) - TL 5.5-6.0 mm. Head somewhat longer than broad and about as broad in front as behind, with evenly convex sides and feebly excavated posterior border. Eyes small, flat, broadly elliptical, placed at the anterior fifth of the sides of the head. Clypeus carinate, its anterior border entire, rounded and projecting in the middle, sinuate at the sides. 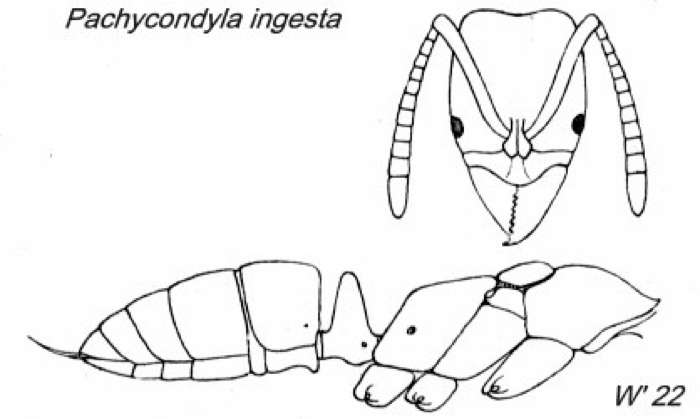 Mandibles moderately long, convex, their apical borders with 8 or 9 subequal teeth. Antennal scapes extending slightly beyond the posterior border of the head; first and second funicular joints subequal, about one and one-half times as long as broad, joints 4 to 6 somewhat shorter, remaining joints, except the last, as broad as long. Pronotum as long as broad, somewhat depressed above and very bluntly submarginate on the sides. Mesonotum convex, transversely elliptical, nearly twice as broad as long, completely surrounded by a strong suture; metanotal groove distinct. Propodeum nearly as long as the pro- and mesonotum together, but somewhat lower, the base and declivity straight, subequal, forming an obtuse angle with each other, the former horizontal in profile, the latter flat; marginate on the sides. Petiolar scale in profile high and cuneate, its anterior surface feebly convex from side to side, its posterior surface flat, with a shallow longitudinal impression in the middle; the border evenly rounded, semicircular from behind, slightly narrowed ventrally. Gaster short, postpetiole sharply truncated in front, the constriction between it and the gaster feeble. Legs moderately long. Mandibles shining, finely and rather indistinctly punctate; remainder of body subopaque; clypeal carina and legs more shining; very finely and densely punctate, especially the head, scapes and thorax. Hairs almost lacking on the head, thorax, and appendages; on the gaster pale yellow, sparse, erect, slender, and rather uniformly distributed; pubescence very fine, yellowish, moderately abundant, investing the whole body, including the appendages. 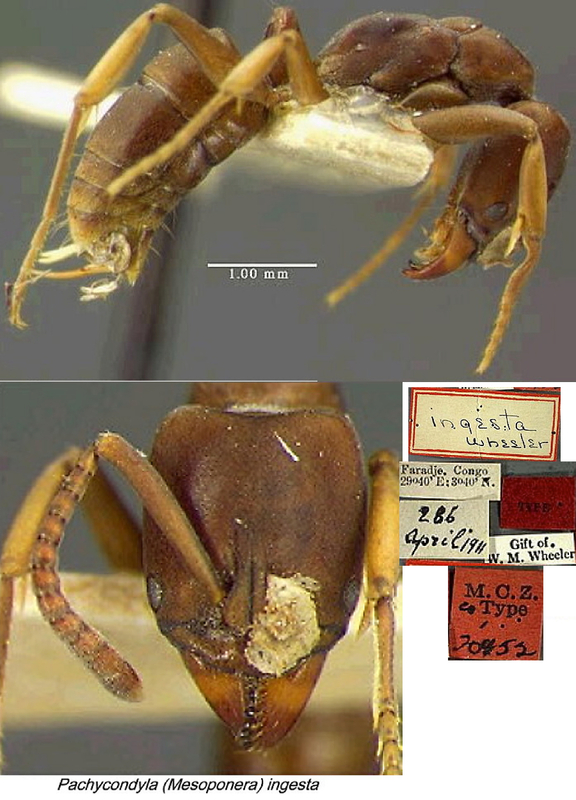 Overall castaneous; legs somewhat paler; mandibles deep red, with black teeth; in some specimens the extensor surfaces of the tibiae are yellowish. The photomontage of the holotype is collated from the MCZ website. Santschi (1930a: 54; Euponera (Mesoponero) ingesta Wheeler) lists others findings from Zaïre, Uélé, Moto (L. Burgeon); Mali, Timbuctu; Dar Banda, Kosa Botolo, Mission Charri Tchad - Chad; Sierra Leone (André); Congo Brazzaville (A. Weiss). He commented that it was close to caffraria Smith differing primarily in being smaller and paler. The photomontage of a cotype is collated from The Smithsonian Institute images at http://ripley.si.edu/ent/nmnhtypedb/public/specimeninfopage.cfm?publicconsumption=1&typespecimenID=682. The photomontage is of a worker from Cameroun; Awae II; collector A Fotso Kuate (fk pachycondyla sp9).